Stainless steel and with nylon line wire is light weight for hanging. With handcrafted woven baskets and hand woven netting. 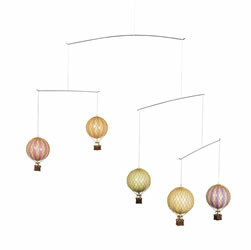 Five pastel colored hot air balloons. Balloons combine color, décor and science, all-in-one. They’re as fascinating today as they were a century ago. Balloons combine color, décor and science, all-in-one. They’re as fascinating today as they were a century ago.